This appetizer is for sure one of the easiest and crowd pleaser among all. The moment I saw this recipe in one of the food magazine, I thought this is for sure a must try recipe and made it the same evening. Everyone just loved it, infact no one was able to guess the filling inside the dates. Preheat the oven to 375°F. Slit the pitted date lengthwise and fill it with ½ tsp of goat cheese pressing the sides. 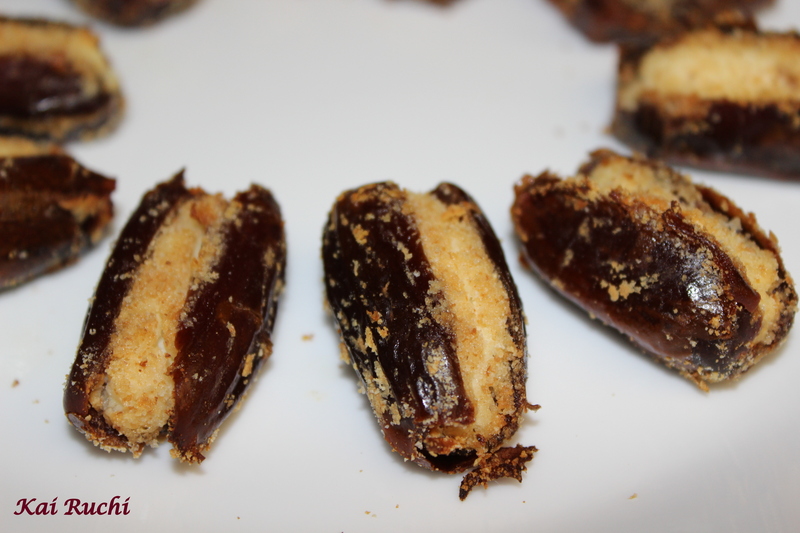 Take the breadcrumbs in a shallow plate and dip the slit side of the dates with breadcrumbs, coating it as a top layer. Place the dates in the baking sheet and bake for 10-15 minutes, (depending on your oven). 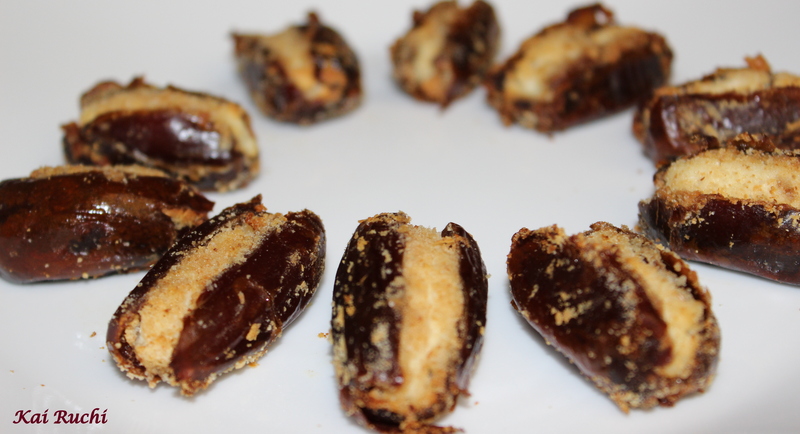 Dates should be soft when done, cool the dates for 5 minutes before serving! Enjoy. Yummy combination ! this is a great and simple recipe 🙂 thanks! After I make this week’s ffwD goat cheese recipe, I’ll try this date recipe as well! Wow! Great combination… I have both at my house and preparing it right away! Mmmmm….these would disappear quickly around here! Simple yet so mouth watering dish.. Love it! wow,love this combination looks delicious!! wow! 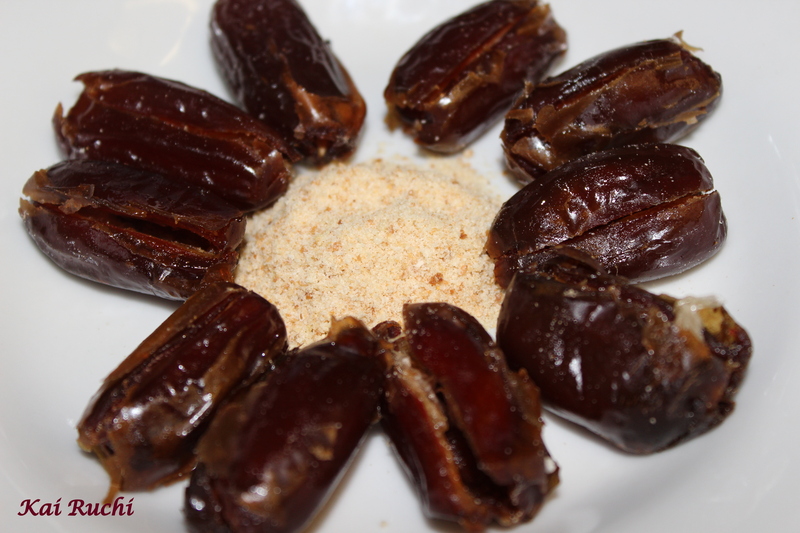 !interesting recipe…I never thought of stuffing dates.sounds delicious!! 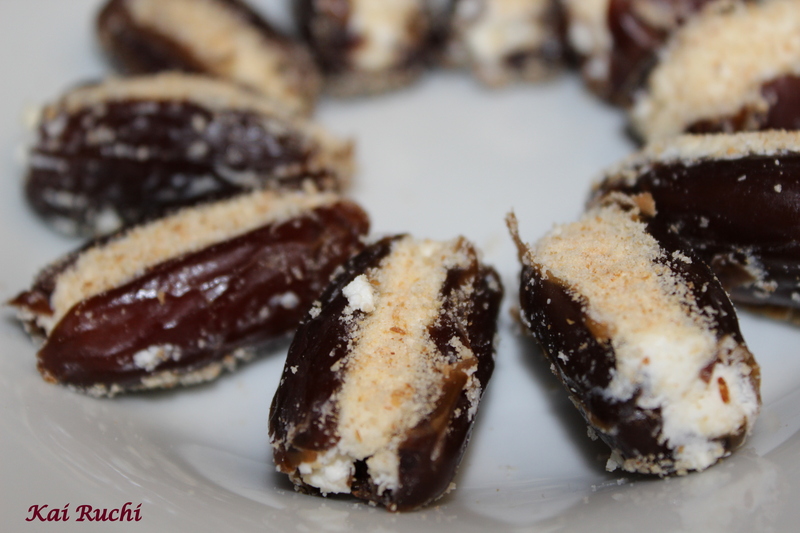 What a nice combination…goat cheese and date…love it…I just need to get some dates next time at the grocery store. Simple and delicious snack! The festive season is starting now and this is a perfect way to finish your lunch/party. I love spice food and I love India. Unfortunately, I’ve never visited South India, but I spent a couple of weeks in Rajasthan and I LOVE it. I love the culture, colours and food. I will follow your recipes in order to be inspired to cook some delicious spicy food. This is an app I can definitely wrap my fingers around—I love the delicate balance of sweet and tang. Lovely recipe dear, I mostly stuff my dates with walnuts but cheese is also a good idea! yum! this is such a fabulous combination!